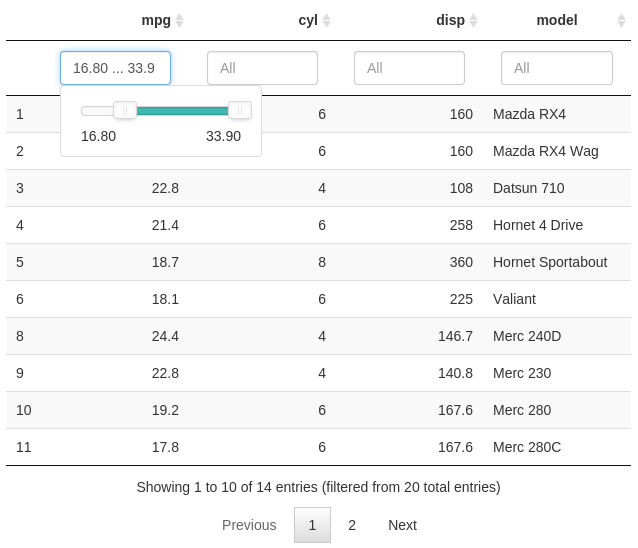 The main function in this package is datatable(), which returns a table widget that can be rendered in R Markdown documents, Shiny apps, and the R console. It is easy to customize the style (cell borders, row striping, and row highlighting, etc), theme (default or Bootstrap), row/column names, table caption, and so on. It is also easy to style the table cells according to their values using the formatStyle() function. You can apply different CSS styles to cells, e.g. 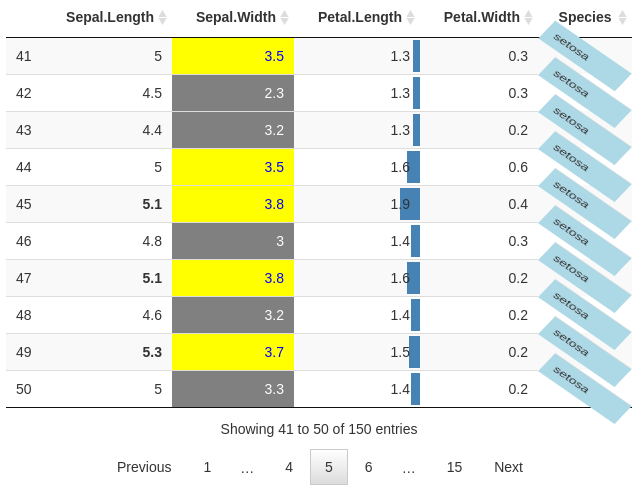 use bold font for those cells with Sepal.Length > 5, gray background for Sepal.Width <= 3.4 and yellow for Sepal.Width > 3.4, and so on. See the documentation page for these formatting functions for more information. 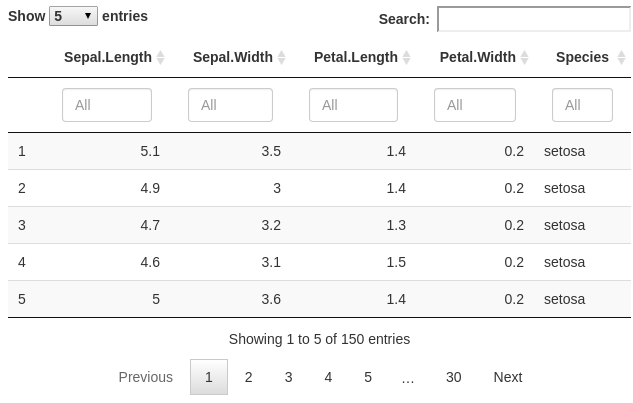 These filters are similar to the ones introduced in the RStudio 0.99 Data Viewer. Column filters work in both server-side and client-side processing modes. You can enable search result highlighting by the option searchHighlight = TRUE. If you have used DataTables before in Shiny (i.e. the functions dataTableOutput() and renderDataTable()), it should be trivial to switch from Shiny to DT. DT has provided two functions of the same names, and the usage is very similar. Basically, all you have to do is to load DT after shiny, so that dataTableOutput() and renderDataTable() in DT can override the functions in shiny. If you want to be sure to use the functions in DT, you can add the prefix DT:: to these functions. We will deprecate dataTableOutput() and renderDataTable() in shiny eventually as DT becomes mature and stable. As mentioned before, DT uses the server-side processing mode in shiny. To go back to client-side processing, you can use renderDataTable(data, server = FALSE). The first argument of the function renderDataTable() can be either a data object (e.g. a data frame), or a table widget object (returned by datatable()). The latter form is useful when you need to further process the table widget, e.g. format certain columns or cells. When a table is rendered in a Shiny app, you can obtain some information about the state of the table via the input object in Shiny. For example, for a table output dataTableOutput('foo'), the indices of the selected rows can be obtained from input$foo_rows_selected, and the indices of rows on the current page are available via input$foo_rows_current (live example). This page has more information about using DT in Shiny. DataTables has several extensions, and we have integrated all of them into DT. You may enable extensions via the extensions argument of datatable(). 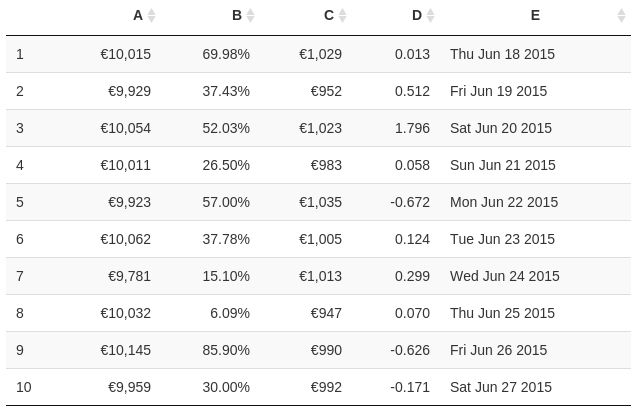 For example, you can reorder columns using the ColReorder extension, show/hide columns using the ColVis extension, fix certain columns on the left and/or right via FixedColumns when scrolling horizontally in the table, and so on. Please see the documentation page for extensions for details. We hope you will enjoy this package, and please let us know if you have any questions, comments, or feature requests.